The fleet segment was down by 7.2%, which after ten months led to a cumulative slip of 4.5%. The Private Market softened by 10.1% while even the Special Channels could not compensate for the performance of the private and the fleet segments and declined by 27%. Overall, the Total Market decreased by 12.2% in October, finishing with 158,000 passenger car registrations. 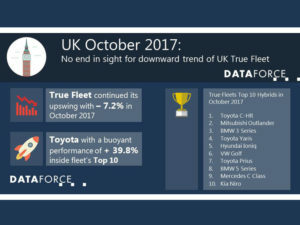 The top ten brands of October ranked, in order, were Ford, Volkswagen, Opel, Mercedes-Benz, Audi, Nissan, BMW, Hyundai, Kia and Toyota. Big movers amongst this group were Hyundai, with a sales increase of 35.6%, with Tucson, Ioniq and i20 performing well. And Toyota saw the highest level of growth with 39.8% thanks predominantly to the Aygo, Yaris and C-HR. In contrast to declining overall registrations, alternative fuels continued their rise with a current year-to-date fleet market share of 5.8%, indicating an increase of 1.3% compared to 2016. In October the alternative segment increased by 40.2% year-on-year, pushing cumulative growth towards 25.4%. Stars amongst this sector were the Toyota C-HR Hybrid, Hyundai Ioniq, Volkswagen Golf and Passat GTE, Kia Niro and BMW 530e iPerformance.